You all have no idea what you're dealing with, do you? (SPOILERS) Midnight Special sadly isn’t all that special. It seems those ‘80s movies that inspired him didn’t rubbed off enough to leave writer-director Jeff Nichols with a remotely affecting plot, let alone one eliciting a sense of wonder. A chase thriller that is only sporadically thrilling, and a science fiction mystery that turns out not to be so mysterious, there’s no doubting Nichols’ talent as a director, but I’m less convinced of his touch when embracing genre trappings. The picture is at its most effective during the opening stages, with the encouraging decision to set the wheels of this road movie in motion midway through events; Roy (Michael Shannon), his son and prodigy Alton (Jaeden Lieberher) and state trooper Lucas (Joel Edgerton) are fleeing the arms of the law, and the cult that has been Alton’s enforced home, courtesy of its leader Calvin (Sam Shepard). We know Alton is special, we just don’t know quite how; the NSA is interested, as Calvin’s sermons have been dropping coded official secrets. Whatever is going on? Intriguing as the set up is, the anticipation soon dissipates. Alton is some kind of next level, highly advanced indigo child, prone to bouts light streaming from his eyes (or having them merely glow in uncanny Village of the Damned fashion), an ability to touch others to their core (the details are vague) and an antenna that picks up signals (as such, his speaking in tongues is revealed as altogether mundane). Alton isn’t really all that fascinating beyond his party tricks, particularly since, like E.T. and (the main template for Nichols) Starman, he just wants to go “home” (and, as with Close Encounters, he must journey to a specific spot to do so). There’s nothing wrong with the performances. Lieberher gives another strong showing following St. Vincent. Edgerton apparently stuffed himself with pies before arriving on set each morning. Dunst seems a bit haggard, no doubt in the name of her art. Shannon acts slightly mental (so no change there). But none of them have been given engaging characters. You expect some nourishment of backstory or character development for Lucas, justifying Edgerton’s presence, but it never comes. Llike the realm Alton is bound for, they are wilfully oblique, but not in that way that can sometimes be rewarding, where less is more because it invites you to speculate and piques the imagination. As such, one rather gets the feeling Nichols had no ideas beyond the limited ones he voices. Hence the rather lame denouement, as Alton joins his people, the ones who live above us and watch us (effectively in a different dimension, co-existing with our own). It’s Tomorrowland redux, right down to the futuristic architecture and these more advanced beings’ blithe indifference to the fate of wretchedly average Earthlings. What’s Nichols trying to say with that? Has he thought about it? He doesn’t consciously seem to be invoking the Rand-ian reading Tomorrowand invited, but it’s still a bit whiffy. Also in the equation is Adam Driver’s benign NSA agent, unable to rise above memories of similar ‘70s and ‘80s characters, be they played by Peter Coyote or Bob Balaban or… usually Bob Balaban. There’s the occasional strong, energised episode in its favour, such as the sequence where Alton is snatched back by Calvin’s minions, or a satellite falling to earth at a service station, or the climactic road block. There’s also a fine Carpenter-esque score, from regular Nichols composer David Wingo. Unfortunately, the latter just adds to the feeling of unworthy homage. 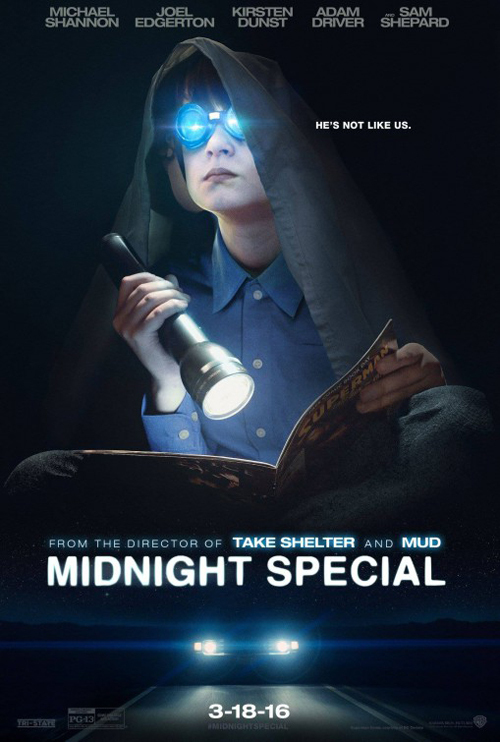 Midnight Special is as cap-doffing as JJ Abrams’ Super 8, but shamefacedly so, attempting to be a little more indie as a counterbalance (too often, Nichols mistakes mood for content, where the mood is mostly dead space). In doing so, he only highlights the picture’s essential emptiness. It’s as if he really wanted to make a sombre, downbeat movie, something closer to, say, The Dead Zone in chilly texture than the bittersweet warmth Starman, and found his intentions muddled by themes of family and transcendence. His last picture, Mud, was highly impressive, so perhaps Loving (also due this year, also with Shannon and Edgerton, but a straight drama) will see him regain his form. Your boyfriend isn't real. We made him. Scare the fangs out of the kid. They like to get the landmarks. When was it we came to adopt man into the jungle? Speak a little truth and people lose their minds. Monster? We’re British, you know. Might I offer you some advice? The time for spawning is very close! There are no other women like you. You’re a man! Go ahead. What else do you see for me, doctor? Is he a pig? He sure eats like one. I can't drive. I'm a goose. It's called Boutique. An exclusive selection. What do we want the French for? You cannot walk away from the Mafia, Mr Steed.